The ringing in the New Year is celebrated by millions of people all over the world! So how do you ring in the New Year? Do you have a specific tradition, such as watching the ball drop from New York City or perhaps attending a gala full of beautifully dressed people and plenty of champagne. Back in August I decided to attempt to achieve one of the items on my bucket list- A Half Marathon! For some this is something that is an easy feat, for me running has never been in my wheel house. The idea of running always evoked a sense of frustration and at times fear. Why? For decades, I compared myself to other runners who were sleek, fast and motivated by beating their last time. The thought of standing among, what I perceived to be, physically trained athletes just scared the living crap out of me! The 5 K's and 10K previously run were fine as that distance seemed manageable. What changed? I changed, I changed my perceptions, did some research and last year, with nervous anticipation, added a Half Marathon to my bucket list. Let the training begin and it did in September! 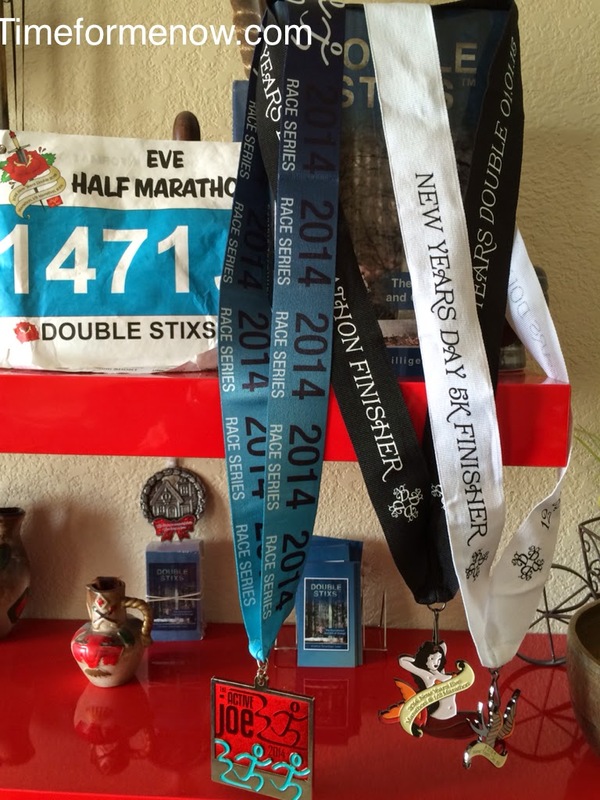 I found and registered for a New Year's Eve Half Marathon and a New Year's Day 5K. My thought process was end the year overcoming fear and accomplishing something I had in my vision. Then begin 2015 invigorated and encouraged to run after any and all of my dreams this year! As in any plan, life tends to get in the way, my road to accomplishment was no exception. There were many obstacles, transitions and a few times training stopped due to physical injuries over the four month period. Could I have stopped and chalked it up to "I tried" it just didn't work or "wasn't meant to be"? You betcha! Boy am I glad that I shifted my mindset and made the change! I completed the Half Marathon in 24 degrees at start time and 34 degrees at the finish line. The 5K on New Year's day started at 33 degrees and ten minutes into the race, rained poured down, the temperatures dropped and the path began to turn to ice in spots. Seriously it took me days to feel totally warm. Emotion on both days at the finish line was overwhelming! A sense of accomplishment that no one can take away from me! I own it and I am so grateful to my body for allowing me to realize a dream. So what changes are you thinking about making or trying in your life? What is stopping you from putting action into motion to accomplish? Remember, even the smallest of changes or adjustments can make a difference. It doesn't have to be perfect or pretty! I know my actions/motions were not sleek or perfect form but I got it done! Running to or embracing Change sets into motion energy and activity that begins to open opportunities, experiences and brings about accomplishments. Confidence within each of us allows for us to experience all that life has to offer each and everyone of us! Time for me now to remind you that each of you are amazing, worthy and have the ability to achieve all that you want to for and in your life! Time to start now! Chapter 6 in Double Stixs™ : The Nourishment and Gift of Change includes an exercise to support your desire to energize the confidence just is and has always been within you!